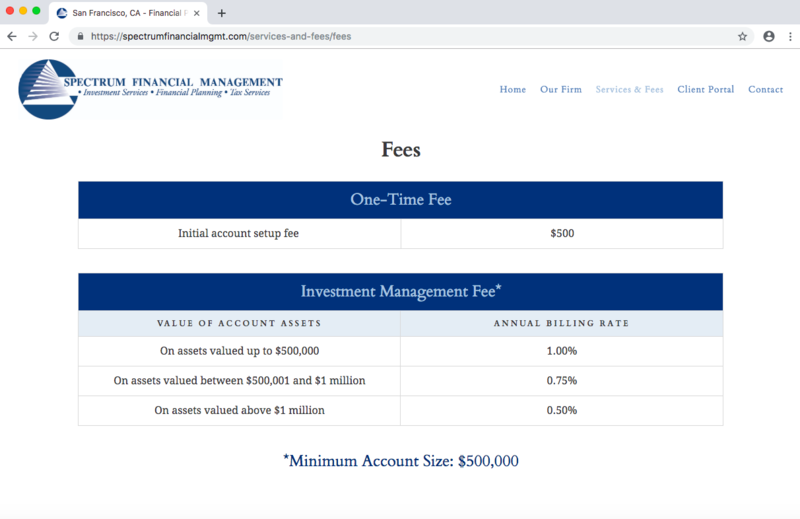 Why would advisors want to share fees on their website? Well, if you don’t share it, then visitors will think that they have something to hide, such as unreasonably high fees! 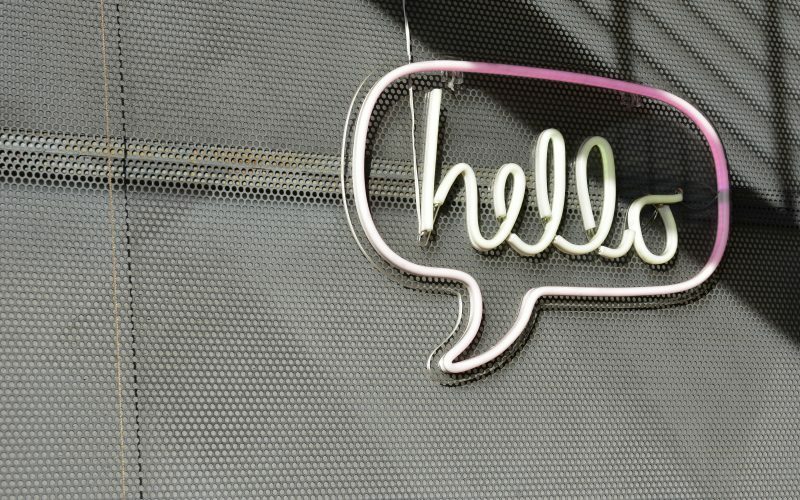 So, we are here to share why you SHOULD share your fees on your website! 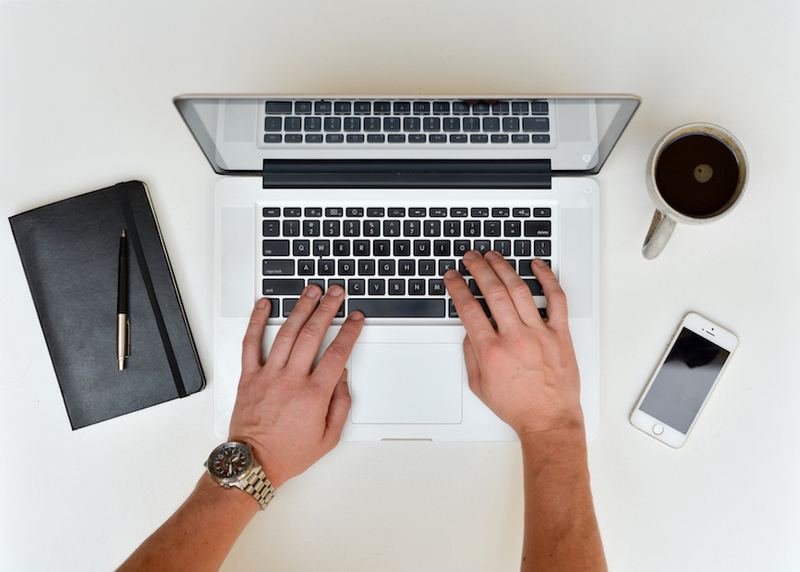 Why Is It Important to Share Fee Information On Your Website? In the past, you may have seen advisor sites, that suggest meeting in person to discuss pricing. While this may sound like a good idea, in reality, doing this could actually cause potential clients to make decisions that aren’t best for both parties. By not including pricing information right there on your website, the impression you end up giving is that you are really expensive because when you don’t see prices at all, you usually assume that they’re going to be much higher. So, somebody who may be a good fit to work with, you might never even get the chance to talk to them on the phone. Advisors may worry that others will compare their prices to other advisors, and they will lose out on a potential client if their price is too high. However, if you don’t put this information on your website to begin with you may not even get the opportunity to talk to them in the first place. Your financial planning fees are actually required by law to be open to the public. So if they’re not easily accessible through a communication channel such as your website it may seem like you are trying to hide pertinent information and it can be difficult for prospects to find the information that they are in search of. It also makes it harder for others to refer you if they can’t find a price. Listing your fees up front will also enable you to conduct an initial pre-screening, rather than taking the time to meet with someone who can’t meet your minimums. One of the most wasteful things you can do, from a business development perspective, is to spend time meeting with prospects who won’t actually even be able to do business with you. When potential clients can see what it costs to work with you, then they can move on without having a meaningless meeting. We have worked with numerous advisors to ensure that their websites are up to par, cohesive and lead generating. The sites we’re sharing below are all Twenty Over Ten clients and we think they all do a wonderful job of providing great examples of how to correctly and creatively display fees on your website. Twenty Over Ten client, Myra Wealth, is incredibly straight forward in their “pricing” section of their website. In the above image, you couldn’t really be more clear than the plan options listed out to the left, then the services that you will be getting in the middle of the page. Additionally, there are add-ons listed at the bottom that list out the price for if you want to add on tax returns, estate planning and immigration. We love how straightforward Myra Wealth was when they listed pricing on their homepage. You know immediately up front what you will be paying and the services that you will be getting. We think this is so important, and it really shows that Myra Wealth is a company that you can trust. 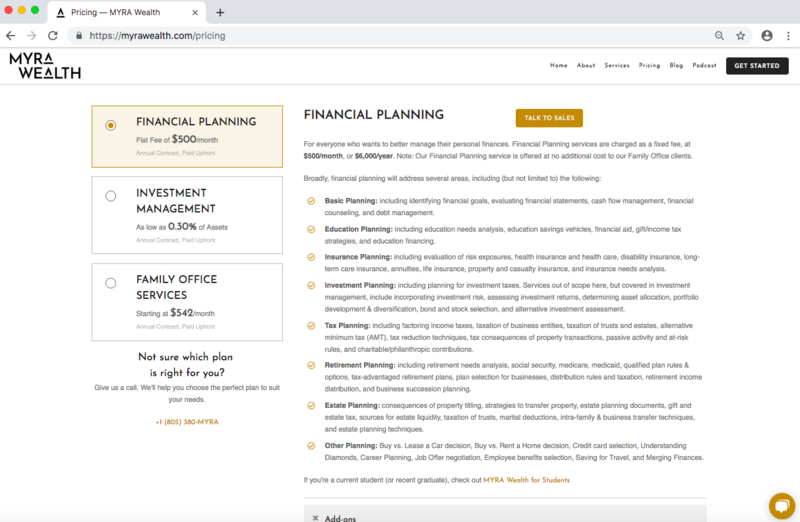 Based in San Rafael, California, Twenty Over Ten client, Spectrum Financial Management, has its fees listed in the pricing section of their website, as well. You are made aware that right off the bat, you will be paying a setup fee of $500, and that the minimum account size is $500,000. As mentioned before, this saves so much time and money, because if a potential client can see that they aren’t qualified, then it will save the initial first meeting to discuss these types of details. Immediately upon landing on the homepage of Twenty Over Ten client, Green Mountain Planning, you feel a sense of calm as though you will be working with an advisor who really cares about your well-being and future. When you then check out their “fees” section, you can see that they are up-front with their pricing, letting prospective clients know exactly what they will be getting. 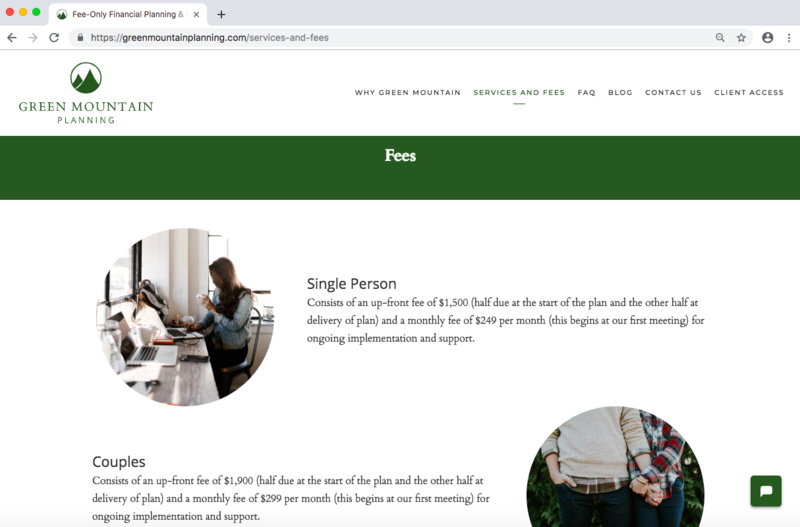 In the above image, Green Mountain Planning starts out by listing what it will cost as a single person or for couples to work with them. You know exactly what you will be paying up front for both and then each additional monthly payment. 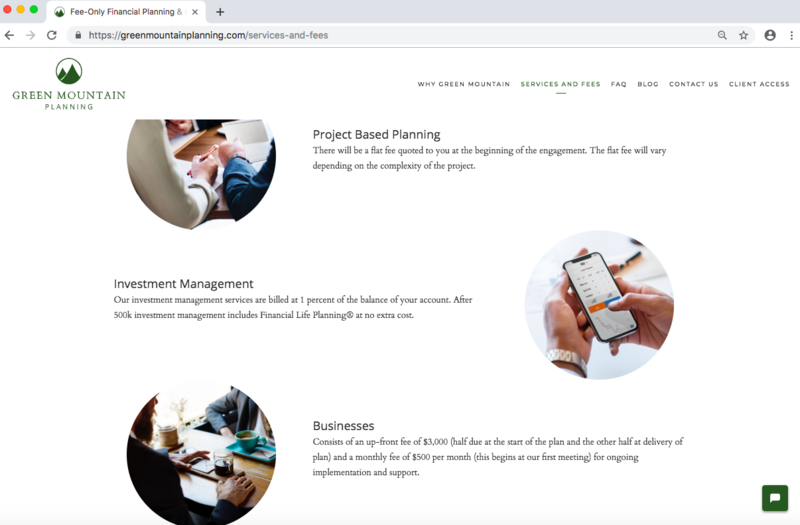 For the next three plans from the image above, either “Project Based Planning,” “Investment Management,” and “Businesses,” they show you what you will be paying up front. Even though “Project Based Planning,” doesn’t have a stated price due to the nature of the work that you will be doing with this, they still state what you will get directly up front. We just love how Twenty Over Ten client, Stewart Advisory Services, Inc. decided to visually display their services in a neat chart. With this chart style, there are no questions about what you get as part of their financial planning fees. From a one-time plan to different tiered levels (silver, gold, platinum, platinum plus) prospects and clients of Stewart Advisory can choose which option will best fit their budget, lifestyle and financial needs. Including your fees on your website in this digital age is an absolute MUST. Not only is it a good business tactic but it helps to fulfill the promise of your brand to actually be a fiduciary, as well as, save time by screening visitors that can’t actually afford your work. 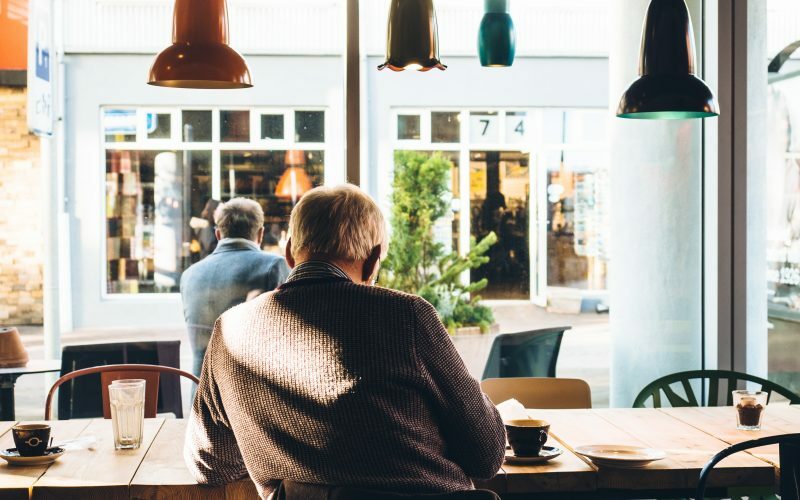 Your clients trust that you are able to help them shape their financial future and that you’ll handle their money properly and with respect, then it’s so important to be transparent and open about crucial information like your fees. Don’t be afraid to get creative with how you decide to articulate the value behind the fees that you charge. For example, you could consider putting copy such as “our fees equal what you would pay for a cup of coffee every day” or a gym membership, etc. This is a creative way to equate your fees to other tangible things to help your site visitors better understand what you charge upfront. Ready To Start Attracting Clients?